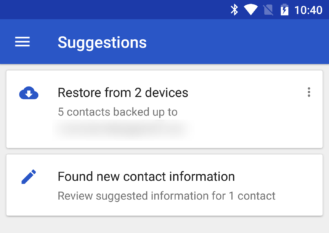 A new version of Google Contacts came out yesterday, but it unfortunately doesn't seem to solve the recent issue with contact syncing that some Oreo users are reporting. This update appears to mostly fix bugs, but it does come with a couple of minor tweaks and some preparation for new feature additions in the future. I rarely bother with pointing out phrasing changes when they don't actually change any functionality, but since the Suggestions screen will be immediately relevant to the teardown and this change speaks to the nature of what's to come, it's worth giving a mention to this one. With v2.4, you'll now find suggestions for 'new contact information' are going to be more specific that the source of the information is coming from Gmail. That's no different from what this feature did before, it was just non-specific about the source. In fact, it isn't until you look at the suggestion that you can see it came from Gmail. You can also hit the overflow menu to see the specific message. This is just a change to the text, there's no functional difference to how it works. As for a reason for the change, skip down to the next section. 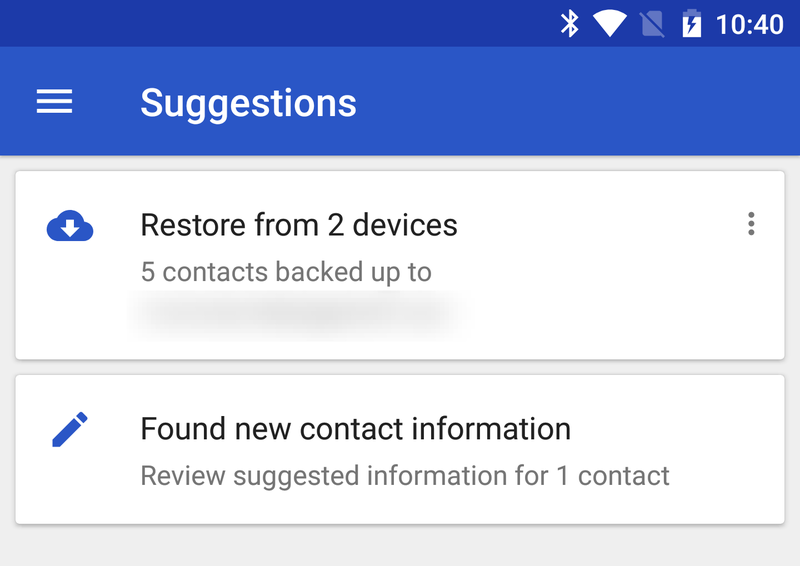 The Suggestions screen is coming up on its first birthday, and most of us know it for tirelessly pointing out duplicate contact entries. 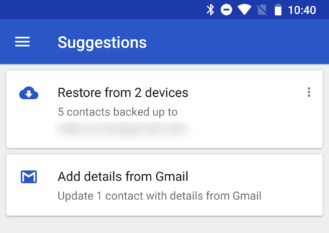 It can offer a couple of other helpful hints, like pointing out changes to contact information discovered in Gmail (as pointed out earlier in this post). There's going to be a new tip coming up that will remind us if any of our contacts are missing names. 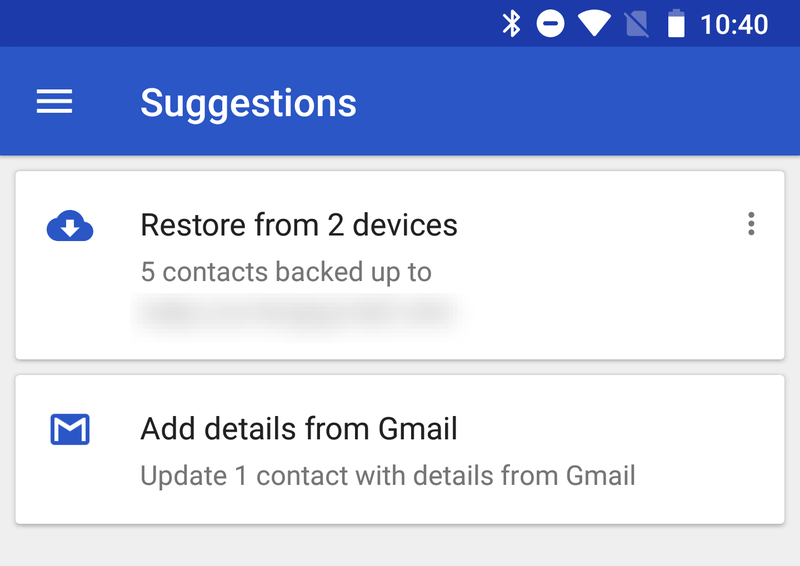 This probably isn't a huge change for most of us, and it may even be annoying for those that have a pretty large collection of nameless phone numbers to work through. However, it'll probably be quick to run through any saved email addresses and other contact entries that are a little easier to identify based on clues. 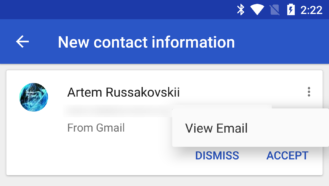 We've seen Dual-SIM (or Multi-SIM) support cropping up in Google's Phone app and Android Messages, and now it's time for Contacts to get into the game. It will be possible to choose (or clear) a SIM to be the default for calling. I'm not quite certain, but it looks like this will be per-contact, so you'll probably be able to split personal and business contacts between two lines if that's helpful to you. I'm less confident that you'll be able to batch those assignments quickly. Note: I don't have any Dual-SIM phones to test with, so it's possible this is already live and I simply have no way to see it. If you're using a Dual-SIM phone, take a look around in the menus and open contacts by tapping on their image in the call log of the Phone app (which opens a contact sheet). The option may be live for you already.